Panasonic Eluga review | What Hi-Fi? Panasonic has made phones in the past, but this is the first time the company has had a serious crack at the smartphone market. The Panasonic Eluga packs in plenty of the necessary features, as you’d expect, including waterproofing. There’s a 4.3in QHD OLED screen, with a so-so 960 x 540 resolution. It sports the Android 2.3 Gingerbread OS (a 4.0 update is already slated for summer 2012). An 8MP HD camera is par for the course, though a front-facing camera is absent. The 4.3in display takes up most of the front of the phone, while a curved rear chassis won’t make much of a dent in your pocket. It’s slender, just 7.8mm deep, and light, weighing only 103g. It’s also rather slippy in your hand. The USB and sim card slots on the top of the handset are covered with rather clumsy protectors but we’re more concerned with the quality of fit and finish around edges and corners. Last but not least: the button placement. The on/off button and volume controls are on the back of the device, and using them doesn’t come remotely naturally. Moving around the interface is OK but swiping between screens isn’t as fluid as you’ll find it elsewhere and it’s not as responsive as most of its rivals either. While the processor is no great shakes we’ve seen better performance from the same spec – such as the LG Prada 3.0 – but it could be improved via software updates. 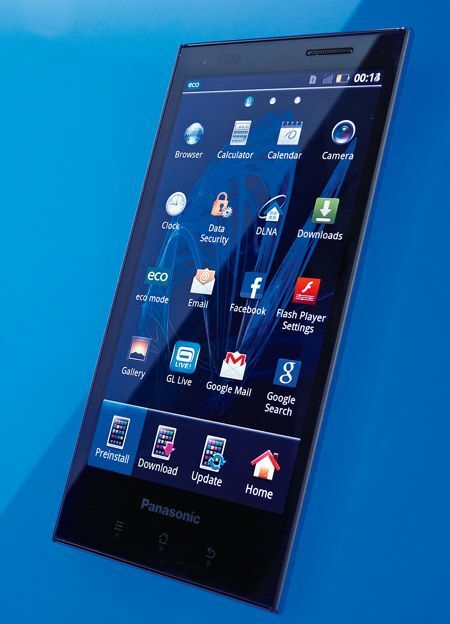 It’s a similar experience with internet browsing; Panasonic keeps it simple with the design of the browser. Browsing speeds were fine but not quite as fast as some of the beasts now out in the wild. The screen delivers impressive bright whites to make text easy to read, but zoom in or look at pictures and the lower-res screen does break-up a little. There’s no Panasonic store for video so it’s straight to Google’s Play Movies app if you want to rent SD and HD films directly on the phone. You can, of course, load on your own H.264 and MPEG-4 video files, too. With the company’s current rich vein of form in TV land we had high hopes for video here, and the OLED screen certainly has plus points. Colours are natural, there’s a good sense of depth and black levels are dealt with admirably. But as with internet browsing and streaming video, the level of detail and edge definition leaves a little to be desired at times. A clearly named ‘DLNA’ app lets you stream content to connected devices across your home network, while there’s also a Viera Remote App that controls your Panasonic TV and throws content to it from your phone in real time. Sonically it’s decent enough. The synths in Coldplay’s Princess of China sound clean, while there’s good detail in the deep bass notes. There’s a little more scale and a touch more refinement to more testing tracks on the best phones out there, but the Eluga sounds pretty good. The camera again favours a natural colour balance, reproducing colours with good subtlety, but the level of detail and noise on still pictures falls short of the best, leaving edges a little softer. Call quality and battery life are more par for the course, though, due to the lower screen resolution and less powerful processor, we’re disappointed that the battery life isn’t better, in fact. We’re left a little underwhelmed by the Eluga. Bar the waterproof angle, it’s a pretty run-of-the-mill phone that does little to separate itself from the pack.